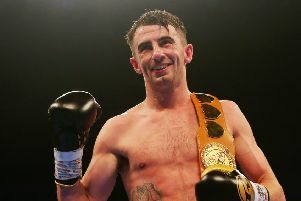 Former IBF Flyweight World champion Dave ‘Boy’ McAuley hopes Carl Frampton takes his time before deciding what he does next. Frampton lost in his brave bid to rip the IBF Featherweight World title off Josh Warrington in Manchester on Saturday night. Warrington won the fight 116-113, 116-112, 116-112 on the judges scorecards which means ‘The Jackal’s’ dreams of unifying the division and maybe having a crack at a Super-featherweight World title lay in ruins. A devastated and emotional Frampton said after the fight that he would take his time before deciding his next move. And McAuley agrees that Frampton should take stock before deciding what to do next. “I would take two or three months out and spend time with my family and then make my decision after that. “I wouldn’t rush in to it and wait for my head to clear. “I would then weigh-up all the options and see what was on offer and then decide what I wanted to do. “I wouldn’t rush in to make a decision. I would take my time and then decide what you want to do when your mind is clear. And McAuley says he was surprised with how good Warrington’s performance was on the night. “I got my prediction totally wrong. I thought Carl would walk out and walk all over the top of this guy but the opposite happened. “Warrington was like a whirlwind and was all over Carl like a rash. I thought Carl would have been the guy dishing out all the punishment out but he was the one taking the punishment. “Look he has made history, he has made good money and he has all his marbles intact. He has a lovely family and why would he put that all in jeopardy? Maybe the time is right for him to go - but that decision is Carl’s and his alone,” added McAuley.